You may want to supplement this package with our HIPAA Omnibus Rule Manual for updated, total compliance. Contact us at 941-587-2864 or info@dentalenhancements.com and we will help you make the right decisions for your Healthcare Environment. HIPAA made EASY™ provides legally useful HIPAA compliance information, products and services but does not give specific legal advice. By purchasing and using these products and services, you acknowledge that HIPAA made EASY™ is not an attorney and suggests that for resolution of specific legal problems you would contact an attorney specializing in these areas and licensed to practice law in your particular area. HIPAA made EASY™ to the best of our ability and with the aid of legal support for proper interpretation, does bring you this synopsis of HIPAA Omnibus Rule. This is merely an introduction and overview. 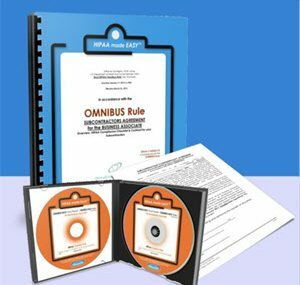 You are encouraged to more rigorously study and to apply all specifically related Omnibus Rules into your Practice. For more concise thorough guidance or in the event of a HIPAA inspection or investigation we recommend you to seek counsel from a legal advisor specializing in this area of law. HIPAA made EASY™ is a training platform that will deliver the framework and an overview of HIPAA Omnibus Rule. In purchasing these training materials, you understand this and hold harmless HIPAA made EASY™ and their related companies from charge. This material is made available for individual purchase by healthcare personnel for formal training purposes only. All information was prepared from sources deemed reliable and subject to change because, HIPAA law is continually updating. This presentation cannot be reproduced in whole or part without expressed written permission.